A call to Toby Maclaurin at Ocean Independence brings more details of his joint listing with Marco Vandoni, the classic 47.96m motor yacht RS Eden. She was originally built in 1930 by Defoe Boat & Motor Works to a design by John H Wells and passed through a succession of owners and names, even being requisitioned by the US Navy in World War II. Purchased by her current owner in 2005 in a state of some disrepair, she spent the best part of the next two years being completely rebuilt at Neta Marine in Bodrum, Turkey, working with a team from across Europe, including Axel Vervoordt in Belgium. The brief was extensive, including the requirements of adding an owner’s office and extended aft deck, improving visibility in the dining room, the capability of meeting MCA standards, and generally of returning the vessel to her original classic 1930s style, paying special attention to her original features and aiming to retain as many of them as possible – all while bringing her navigation and communication systems into the 21st century. Now RINA classed and MCA compliant, RS Eden accommodates 11 guests in six staterooms while twin 650hp Caterpillar give her a stately maximum speed of 11 knots and a range of 4,000 nautical miles. 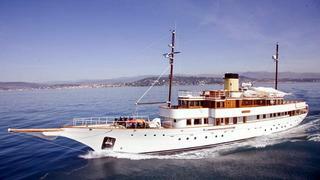 RS Eden is asking €12.5 million.